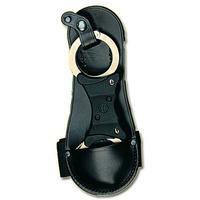 This specialist Speedcuff pouch has a clip which slips inside the top of the motorcyclist's boot. A strong Velcro strap is then fastened round the rider's calf/ankle area. The speedcuffs have just a quarter length pouch at the bottom end for easier release but perhaps less protection in poor weather conditions. This pouch weighs 160 grams (5.6 oz). The Speedcuffs are not included, sorry!